H&R Block Deluxe 2018 doesn't include Schedule D? I've used H&R Block software for several years. Last year I purchased the Deluxe version and it included Schedule D for capital gains. From what I see this year, it looks like I will need to buy the Premium version to get a Schedule D. Can anyone confirm this or correct me? walmart.com had a pretty good price earlier in the week but I missed it because I wasn't sure which version to buy. Last edited by IowaFarmBoy on Sat Nov 17, 2018 9:32 am, edited 2 times in total. Re: H&R Block 2018 doesn't include Schedule D? The website side by side functionality display shows that Premium is required for Schedule D. I also pulled up a PDF listing all forms available in Deluxe and Schedule D is not listed. Seems to me it's more Mediocre than Deluxe. Thanks silk and jeb. That is the problem- the really explicit sections that silk found indicate I need Premium this year. But jeb's link shows Schedule D mentioned for Deluxe but it feels like they may have forgotten to update a webpage. I've posted a question to them via Facebook. I'll post back if/when I hear something. Last edited by IowaFarmBoy on Sat Nov 17, 2018 9:41 am, edited 1 time in total. Thanks silk and jeb. That is the problem- the really explicit sections that silk found indicate I need Premium this year. But jeb's link shows Schedule D mentioned for Deluxe but it feels like they may have forgotten to update a webpad. It is clear that H&R Blocks website is as clear as mud. It will be interesting to get your feedback on what they say. Re: H&R Block Deluxs 2018 doesn't include Schedule D? I may have just found the answer on their website. At least it might explain the conflicting info. They offer both online and downloadable options. The online appears to not include the Schedule D.
The downloadable version appears to include it. I have always bought the downloadable versions. The Schedule D is listed and it's really there, but I notice that everything says "final expected 1/16/2019"
I think it goes without saying that due to the huge... changes... in the tax code, and the haste with which they were implemented (giving the tax prep companies little time to prepare), that this year we are going to be in for a lot of problems, glitches, bugs, missed deadlines and delayed availability of software components, IRS nastygrams informing us of incorrect preparation despite using software, etc. Last edited by nisiprius on Sat Nov 17, 2018 9:51 am, edited 2 times in total. I agree with Nisiprius that we will have to be patient this tax season. The tax code change is HUGE and there will be many glitches until at least April 15. For this reason, I will set up my own calculations and will verify the software calculations with mine. "Good morning, we apologize for any inconvenience. It looks like we're in the process of updating some information for the next tax season. Currently, we don't have a list of supported forms for each product. The web site will go live for 2019 tax season on November 30, 2018." At this point, I think that the downloadable Deluxe will have what I need- it did in the past and it looks like they intend to support that same functionality for 2018. It's too soon to be complaining about tax software. None of the vendors have a finished product yet. I don't see anyone complaining about tax software, just looking for clarification and the specifics of a particular package. You don't have to "have a finished product yet" to have a website that reflects the broad capabilities of your product offerings. Those are established well in advance. That appears to be an entirely separate issue from the standard every year practice of tax software sellers' calculated vagueness about their product levels to induce people to by a more expensive product than they need (or alternatively to entice them in at a cheaper level, then trap them into an upgrade). I downloaded the H&R Block Deluxe 2018 version a few days ago. It has schedule D and related worksheets. The online Deluxe version is different then the downloadable Deluxe version. Not sure why but one does not contain Schedule D.
Yes, Schedule D and all the rest or included in the version I downloaded to my laptop. I got the desktop 2018 deluxe w/State for about $20 a few days ago. I suppose the reviews of tax prep software will start appearing. Most of the them won't apply to people like me, but instead will discuss how well they work on a smart phone. Looks like H&R Block is just taking a page from the TurboTax playbook. Intuit has been doing the "Cripple the online version" thing for at least a few years now. Similar to H&R Block, the download/CD version of Turbotax Deluxe has Schedule D as well as pretty much all the other forms you can ask for, it just lacks some extra guidance and handholding on some of these additional schedules. Some of the commercials on TV show a young person just 'snapping' a photo of their W2, then their taxes are filed and they then go buy a latte! LOL....if only life were that easy. Every year I buy and download H&R Block Basic. Every year, including this year, it includes Schedule D (as well as the dreaded Form 1116). I just fired up the copy I bought and it indicates the final version Schedule D will not be available until 1/16/2019. It has always baffled me that the folks here with all their expertise seem to always buy the more expensive product, which just seems to do more hand holding. Which STATE program came with your software purchase? One year I had a young woman come into my TaxAide site. She explained her situation to me like this. "My federal taxes were filed on a smartphone but there is no way to file my state taxes on the phone." Me: "Who filed your federal tax - do you have a copy?" "No, my boyfriend filed them before I knew it. Check that, my former boy friend filed them." I felt sorry for her so I re-did her Federal return, filed the state return and gave her a paper copy of the whole thing. I live in Virginia and the state has a reasonably easy to use site for doing the taxes online, so I do not buy the state form. Would be interesting to look at the added cost of combining that with Basic vs higher end options. My impression is that many states offer online filing, but perhaps I am just spoiled by VA.
Yikes. Yea those commercials always make it look so 'easy' like one is done in 5 mins. Also makes me think of Steve Forbes and his 'flat tax' platform in the 1990s.....which of course never came to fruition. Does 'basic' even include 'state'? Not sure (?) it does and is maybe one reason people buy the higher level software package. Its just nice to have it all encapsulated in one program. I'd personally rather 'overbuy' and be prepared then try to backtrack and have to purchase something I needed to begin with! But you may recall that Turbotax TRIED to take schedule D out of the download/CD version of Deluxe a few years ago, to have it match the functionality of the online version (as opposed to adding it to the online version, of course). That was met with a great outcry and resulted in them giving a free upgrade to Premier for many customers and a pledge to include schedule D in the Deluxe version the following year. Last edited by MisterBill on Fri Dec 28, 2018 3:05 pm, edited 1 time in total. Well, if you don't have any interest or taxable investments and just pay rent, it could be. Hey, Trump said we'd be able to file on a postcard with the new tax law. I do the same thing in Ohio. Bought H&R Block basic and will use Ohio’s online system to file state electronically. In Basic, when you finish Federal they offer to sell you state. I'm just not sure what the price is. Walmart has Basic for $14.07. So the question is when you add whatever they eventually charge to add the state software, it the total less than buying one of the more expensive versions? Where is this available for $20? With state paper filing, H&R Block $20 is the best deal. eta: Without the $20 deal, H&R Deluxe with State is $27 right now, so each of the above is $7 more. HRBlock sent me an unsolicited CD and a $25 off code, set net $19.95 + tax. I file a NY tax return and NY law says no one can charge for e-filing a NY tax return. I know others got something similar last year, so it much be going around again this year. Amazon currently has H&R Block Tax Software Deluxe + State 2018 with 5% Refund Bonus Offer [PC Download] for $26.99. Not quite $20 but close enough I would bite (got mine for $19 on Black Friday). 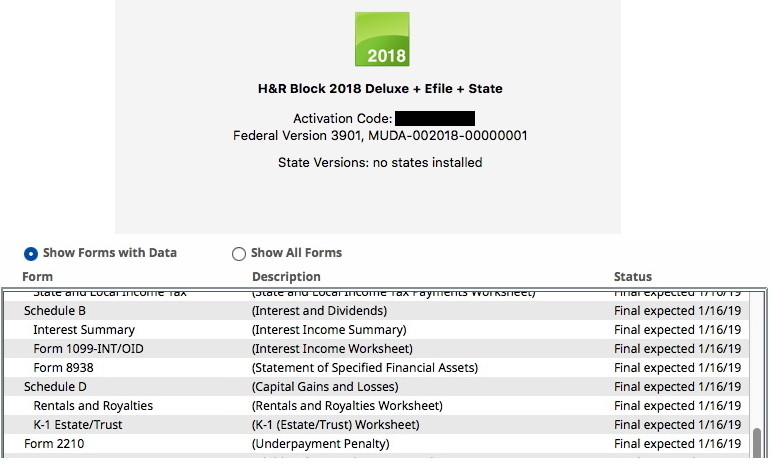 Re: H&R Block Deluxe 2018 doesn't include Schedule D? I didn't read all the other replies but I "test printed" my return; schedule D is there. I have HR BLOCK DELUXE....2018. Don't state e-file, print and mail for just the cost of postage. TurboTax state e-file gets more expensive each year. I am about to go over to mailing the return, despite the fact that Michigan virtually begs everyone to e-file. If you have a refund coming, it will be SLOW if you file on paper. They should pass a law like in NY saying that you have to e-file and can't be charged for it. The problem for many with mailing a state return is that you need to include copies of many schedules from the federal return, and those can be lengthy. Still cheaper than paying TT's ridiculous prices, of course.